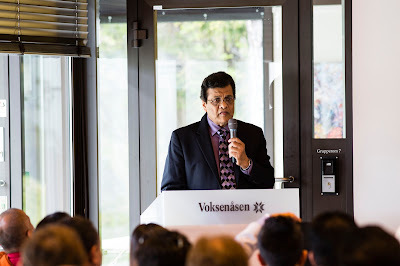 Arakan Rohingya Union has participated at the Oslo Conference on Systematic Persecution of Rohingyas in Myanmar. There were several speakers, including a number of Nobel laureates, prominent leaders from international community, and Rohingya activists from inside Myanmar and diaspora. World renowned figures, George Soros, Bishop Desmond Tutu, Mairead Maguire, José Ramos-Horta and Dr Mahathir Mohammad, delivered pre-recorded video messages. Former UN Special Rapporteur Thomas Quinta and Penny Green also participated at a panel discussion. Additionally, the head of the delegation of monks from Myanmar and several officials from international advocacy groups, including Mathew Smith of Fortify Rights, Malaysian former General Azumi, Dr Gianni Tognani, The Secretary General, Permanent People’s Tribunal also spoke at the conference. The speakers from the Rohingya community include U Kyaw Min, Abu Taher, Mohammed Nayeem, and Wai Wai Nu from Myanmar, and Daw Khin Hla, Nurul Islam, Dr. Wakar Uddin, MaungTun Khin, Dr. Ambia Parveen, and others from Rohingya Diaspora. The speakers have made compelling arguments about the needs for immediate solution to the plight of Rohingya. The conference has generated a clear message that the violations of human rights and the ethnic cleansing policy of the Government of Myanmar are viewed by a growing number of international experts and advocacy groups as early warning signs of genocide. Arakan Rohingya Union, represented by Dr. Wakar Uddin, has provided an international perspective on Rohingya issue, particularly theprogress made at the international stage and the challenges exist in diplomatic efforts. He expressed his frustration over series of new problems at Andaman Sea and Thai-Malaysian border that are overshadowing the long standing issues such as situation in IDP camps in Arakan, the basic human rights, the citizenship issues, and others. He acknowledged the desire by some moderate senior Myanmar officials to solve the Rohingya issue, but he also expressed the frustration over the lack of progress in Naypyitaw. He stressed the need for increased efforts by the international community and garnering strong support for the efforts by the players inside Myanmar seeking a permanent solution to the problem in Arakan state. Dr. Uddin outlined the progress made by the international community. He stated the importance of the work of the humanitarian NGOs that are having direct effects on the very survival of the IDPs in Arakan. In the diplomatic efforts, he explained the common strategies and outcomesof the efforts by the U.S Government (State Department, White House, and Congress), the United Nations (General Assembly, Human Right Council, and the Special Rapporteurs), Organization of Islamic Cooperation, European Union, and the Canadian Parliament. He has indicated that all the players in the international community is demanding the Government of Myanmar to address some of the most important issues. “Full and equal citizenship for Rohingya, right to self-identify their ethnicity, permanently ceasing all the human rights violations, giving international NGOs unfettered access to IDP camps and other area in Arakan, freedom to worship, repatriation of the IDPs in Arakan and the refugees in the neighboring countries to their home of origin in Arakan. “These are the major issues commonly outlined by all the players in the international community, and the government clearly shows defiance - but they are feeling the pinch’ Dr. Uddin said. Dr. Uddin has indicated that there are much more needed to be done at the international level. Like the message during the current crisis at the Andaman Sea, the message on the rights of Rohingya to the Government of Myanmar should be more coherent with a common theme all the timewhile sustaining the momentum.“Euphoria in the international community over the transition to democracy in Myanmar, early lifting of the sanctions by the Europeans,certain policies of ASEAN, are some of the factors that have attributed to the obstacles we are facing today in making progress on Rohingya issues” Dr. Uddin has pointed out. He called on the international community to insert the pressure on the Government of Myanmar and ASEAN more in coherence, to reinstate the sanctions, and develop a road map with incremental approach including immediate, short term, and long term goals. “Government of Myanmar is the key, and the problem can be solved if the government is interested and has the will power” Dr. Uddin concluded.